There we would be – however many of us there were at the time. All lined up, or as close to that as possible, in the moment before the boys got into some dirt, the moment before we were herded into the car – hopefully not late for church. It was the Easter photo op. Weeks before the event the planning would begin. Mom always made a new dress for me and I still have memories of many of them, partly from seeing the pictures so many times but also I remember how I felt in them, what I thought of the fabric, who I was trying to look like. Little girls always got a hat. Who started the Easter bonnet thing is still a mystery to me but it was a habit that died hard. Easter was also one of the two times when one might expect to get new shoes to go with the new dress. And because the snow might be melting by Easter I sometimes got to wear the new shoes without boots over them. There were so many things about the holiday that spoke of spring freedom. 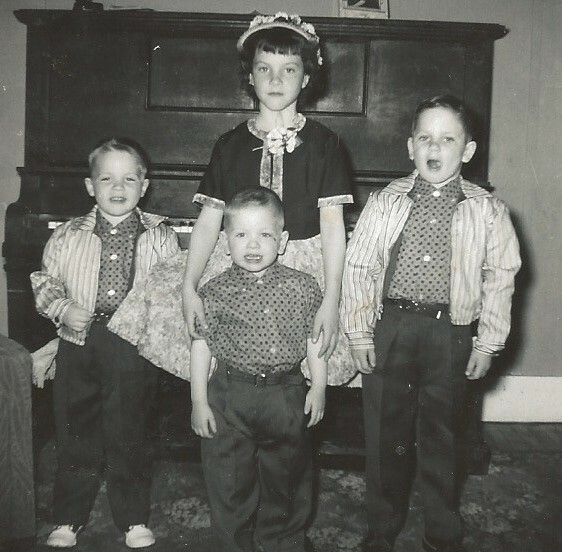 The real miracle of Easter was getting all my brothers cleaned up and dressed in their church clothes before something tragic happened to one of them. For simplicity’s sake they always had matching outfits in various sizes. Often one component or another would go missing – a sock, a belt, a shoe – adding to the craziness of the morning. I can remember family routines of getting things ready on Saturday nights (commonly referred to as bath night). Shoe polishing must have been one of my favorite things to do as I have a mental picture of small shoes lined up, last week’s newspaper underneath them to protect the floor. But it was mom who did most of the work. I think she was the one who took most of the pictures, just to prove she had done the job. Our church family and the routine of the church calendar added much to my growing up years. It was a pretty safe place to be, and there weren’t expectations of perfection that left me disillusioned, jaded or burned out. We were just people and we seemed to know there was something about God that called for our attention. Sometimes we gave it fully and lots of times we didn’t. I don’t think God was surprised. Its consistent memories as kids that help shape us. Friends, family, and events such as Easter stay with us a life time. Yep, you’re right on. Thanks for reading!